SKYTEX Technologies Inc. announced their partnership with EXOPC for bringing in a customized version of their touch-centric user interface to their SKYTAB S-series Windows 7 tablet. With a lot of Android based tablets in the market this model may be of help for all those users who are not yet introduced to android and still uses a PC with Windows as Operating System. 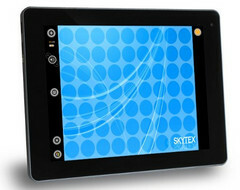 The SKYTAB comes with a 9.7inch capacitive multi-touch display which is capable of recognizing up to 4-points of touch. The display has 4:3 aspect ratio and Skytex intends to impress its users with their EXO User Interface which is said to deliver an additional layer of touch friendly features and applications to the Windows 7 Ecosystem. This model is mainly powered by a dual-core 1.5GHz Intel Atom N550 processor, with an integrated graphics and a 2GB of DDR3 RAM. With this configuration it can be expected that this model will be providing a true productivity and virtually unlimited entertainment possibilities along with smooth media playback as well as document editing. Other Specifications for this model includes an HDMI out port for connecting to an external media device and an integrated 1.3MP webcam and a mic for supporting video conferencing. The users will also be able to enjoy browsing the internet through its Wi-Fi 802.11b/g/in connection. The Shipping of the SKYTAB S-series will commence from early next month though the pre-order window is made open for the interested customers.